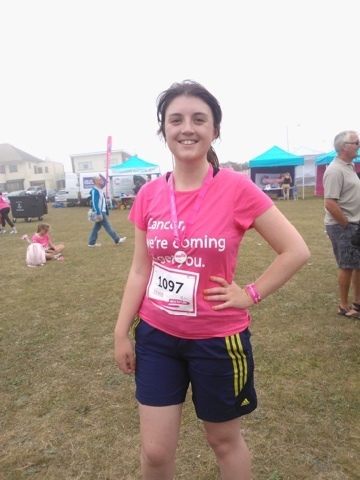 So last Sunday I completed the Race for Life! I was so proud. I finished in 32:53, which given the fact my target was to do it in under 35 minutes I am pretty chuffed about. It's also my all-time 5k personal best which is pretty surprising because a lot of the time on the Nike app I cheat by pausing the timer when I'm resting at traffic lights. But I really guess it was just the adrenaline and the fact there was a super fast 8 year old girl running just behind me the whole time and I would not let myself be beat by an 8 year old girl. I WOULD NOT. (However, two 11 year old girls came second and third - vaguely terrifying?!) Here is a vaguely tragic photo of me after I had finished to show it really happened and that these are not the ramblings of a deranged fantasist. Please excuse the loon-ish grin. It was a proud moment. I loved the whole race day experience and I think I now have well and truly been bitten by the running bug. Once I got within sight of the finish line, I saw my family and boyfriend who had come to watch and suddenly had such an insane and renewed sense of energy I sprinted like CRAZY and went like 400m in what felt like about 10 seconds (not literally). (Obviously). I could tell how surprised they all were that I'd managed to complete it in that time and it was such a great feeling! I definitely want to carry on with races with a dream of one day doing that marathon. I just really love running and I'm so glad I started. Unfortunately, there is a sad twist to the tale as unfortunately running does not currently love me. On race day or possibly the day before I was bitten by a mystery evil insect (possibly a spider, grim). The poison took a few days to properly grab hold before I had a severe allergic reaction which I have cheerfully been describing to friends and family as 'the pox'. I was covered in a totally insane rash which people stopped to stare at on the street before crossing the road to avoid catching leprosy themselves. I was so itchy it felt like I was undergoing some form of literal torture, and I could not concentrate on anything or sleep. I had to spend about two thirds of my time in ice cold showers, only removing myself when the chills and shivering were so bad they outweighed the itching. Seriously. You'll be pleased to know that with the help of three doctors and £70 worth of medicine I am finally on the mend but it has come at a cost as I had to take over a week off running. I tried to head out on Tuesday but around the 2 mile mark suddenly felt as though I was going to faint/vomit to the extent I had to call my grandad to come and pick me up and drive me home. The rash had flared right up and I think it was because of the increase in body temperature. Once again today I headed out for my run, this time with an aim of 1.75 miles just to try and ease myself back into it. I completed it, but only after taking three mini walk breaks and when I returned I was so unreasonably shattered and dizzy from this incredibly easy run. Right now it feels unbelievable that under a fortnight ago I finished a 5k race in a fairly reasonable time feeling great and looking like a human being as opposed to a melted ice cream. All I can think is that this must be 'the pox' and I am going to have to slowly but steadily work to build up my fitness again. I really want to start blogging more again and might even schedule a new post for the weekend RIGHT NOW so watch this space. Also just wanted to say thank you for all the kind comments and messages I've had on the blog from people I don't even know, the blogging community and particularly the health/fitness community is so supportive and obviously I hardly ever blog so am not inundated with comments but when I do get them it's so motivating!